Ho! Ho! Ho! Santa is on his sleigh and on his way to find the Christmas stockings at your house. 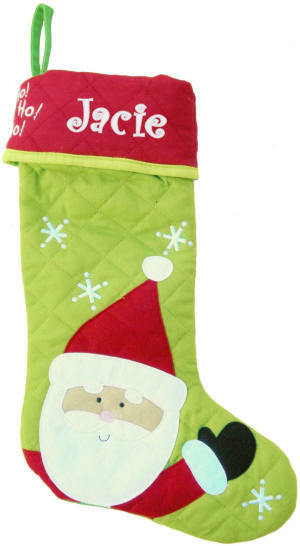 In a festive red and green, with an applique of a jolly Santa, this stocking will be one of the first Christmas stockings to be filled. Santa is an applique of red and white felt, with black felt mittens. The green background of the stocking is scattered with white embroidered snowflakes, and the top fold down red cuff is embroidered with Ho! Ho! Ho! 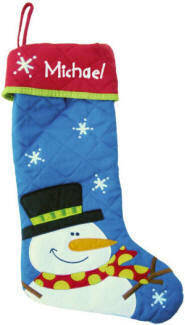 This Christmas stocking from Stephen Joseph is sure to delight. 19 in. long, 7 in. wide.